Homer's infamous Eagle Lady restarted her annual bald eagle feeding frenzy recently. The population that consisted of a few dozen resident eagles is quickly growing to a few hundred. And while her well-meaning eagle baiting brings amazing photographic opportunities to the masses, I'm a bit torn on the issue of blatantly habituating wild animals. If you leave your garbage out where bears can get to it, you'll be fined - but somehow artificially supporting a nationally protected raptor is legal. The Eagle Lady claims the eagles wouldn't survive without her selfless charity. But they were doing just fine before she moved here - wintering in other places around Alaska, where they could still ride the thermal drafts over coastal mountains and hunt for their food. Now they all congregate in Homer and fight for scraps. Wildlife officials say Homer's shorebird populations have suffered since the eagles started coming here in droves. My co-worker swears that his little Yorkie puppy was carried away by an eagle. He followed the Yorkie's tracks until they just ended in an untouched field of snow, specked only by a few drops of blood. It seemed as though if his dog was lifted up by the Rapture (or raptor). In the end, eagle baiting just isn't natural. But it's a touchy subject in this town. 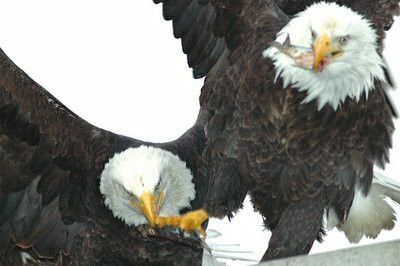 I'd be interested to hear what nonlocals think about bald eagle baiting. I've met eagles before, in Langkawi. They're getting rather overweight and lazy because tourists keep feeding them chicken skin. But they're trying to solve the problem now. Habituating wild animals, although endangered, is 95% of the time a very bad idea. Except in extreme cases of near extinction (i.e. the California Condor), a species, along with the prey and habitat of the species, should be protected - not created. It seems to me that the Eagle Lady has entered into an unsustainable relationship with the local eagle population. At the age of 81, spending thousands of dollars a month, and feeding what seems to be an ever-growing population of domesticated bald eagles - she certainly has her work cut out for her. Here in Minnesota, the eagle has made an amazing comeback. The National Raptor Center is in Wabasha, on the banks of the Mississippi River. To my knowledge, no one is feeding them -- there is plenty of food available. When the river begins to freeze over, they congregate by the dozens on the ice near open water -- it is quite the sight. I agree with Budda43 -- they should not be fed. They survivived for years without our help and we are the reason they were nearing extinction. Sea kayaking eh? You will love it and given where you live, there must be many many beautiful places to paddle. You've got to be an RM to be talking about the rapture. Sounds to me like you ought to write a story on the subject, if you haven't already. Maybe they'd even give you some space on the editorial page, but then the eagle lady will hate you less if you have sources from the Wildlife service saying it's wrong than if you have your photo beside the comments. It's a small town, right? Gotta keep it friendly. But you can definitely write a balanced story including quotes from both the bird lady and those who are concerned about what she's doing. In the lower 48 the bald eagles all congregate around chicken and turkey sheds and scavenge the dead poultry the farmers throw out. Geese have also stopped migrating because parks and golf courses are so accommodating to them. Feeding the eagles is a bad idea, but there are worse sins out there. Hi Jill - Great blog! 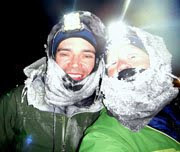 Just zipped over here from TravelWriters...Didn't realize you are a cyclist too...I'm a road cyclist/triathlete...LOVE the descriptions of riding in Alaska - it's far different to my Chattanooga, Tennessee (Southeast) mountains and a hell of a lot colder too! Sheesh! I'm adding your blog to my list! (p.s. my blogger link takes you to my 'old' blog - the new one is http://www.moderngirlskitchen.com). Hi Jill, I love your blog. I think it is horrible to feed any wild animal, but it seems at this point the Eagles are half domesticated. Maybe she should just build a big pen and "help" all the eagles that venture to near. Then she could name them, and sell tickets to help offset the cost of feeding them. I can hear it now (voice of the old circus announcer) "step right up ladies and gentlemen, real live WILD eagles". Or, maybe just quite feeding them and let them live like the have for the last 10,000 years. Eagles have something regal about them when they're living their lives the way that they were meant to, naturally. Baiting them seems to be going against the whole reason to take pictures of eagles... that feeling of awe and wonder and sort of the honor of having an eagle in your presence. Their majesty is diminished by this practice, I think. By the way, and completely off-topic, I work for a TV show, and one of the first jobs that our director had was as a production assistant on "The Cannibal Pirahna Women in the Avocado Jungle of Death" ... small world, isn't it? No one should be feeding the wild animals. You'd think they would have learned from Yellowstone's example many, many years ago when they used to feed the bears the scraps from the hotels. This just makes those animals dependent on people's trash and also makes them more comfortable around humans, which is not good. I'm surprised an environmental or animals rights group hasn't made a fuss over this.